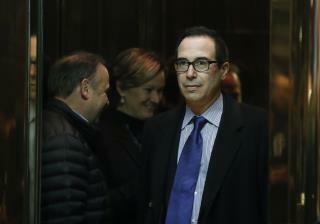 (Newser) – Donald Trump is preparing to name a former Goldman Sachs executive and Hollywood financier as Treasury secretary, the Wall Street Journal reports. Before spending six months as the Trump campaign's finance chairman, Steven Mnuchin was chairman of Dune Capital Management. IMDB lists him as producer on nearly three-dozen movies, including recently Sully and Suicide Squad. Before that he spent 17 years at Goldman Sachs, worked at Soros Fund Management, and co-founded OneWest Bank Group, according to CNBC. God can use a man like Trump. God can use anyone. He used a harlot. Putting Goldman Sachs alum in your cabinet is the BIGGEST crony thing you can possibly do. They started the housing / banking crisis and drove this country into the ground so they could take peoples equity, their 401-k's, pensions, life savings, and then sail out on their "golden parachutes" when they got busted. All without one of them being charged for a damn thing. They fleeced this country and Trump railed against the "special interests" and the financial sector and patted himself on the back for not taking any money from Wall Street during the election. Now here he is opening the door wide for the worst perpetrators of the economic crisis in the US since the Great Depression. I hope the Trumpers are happy with what they wrought. The Suicide Squad name is so apropos of the Trump swamp cabinet. The film sucked and was boring. I am thinking that Trump supporters are not smart enough to be chagrined by the Goldman Sachs reference. Didn't so many of Trumpanazi rail against Hillary for being in tight with them? If corporations don't pay taxes, there is only the middle class left to pay. The middle class is being set up for a huge screwing. Let them eat cake and be ruled by Republicans.